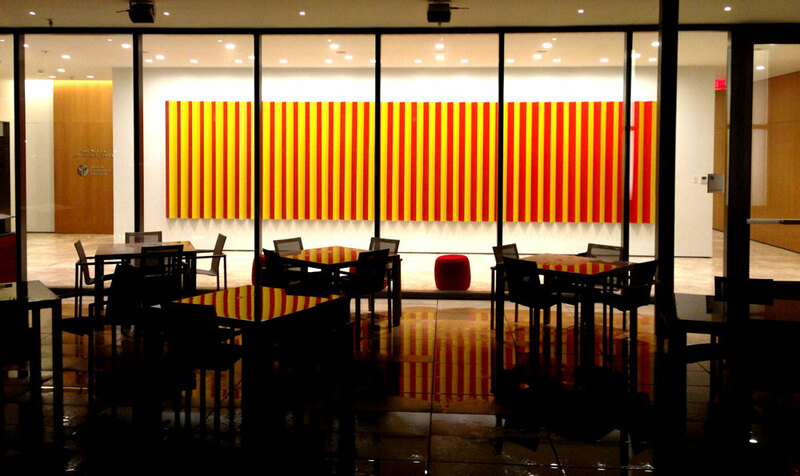 Create a colorful installation for the main wall of the APA’s Capitol View Conference center. The main wall at the APA’s Capitol View Conference center faces a wall of windows leading to an outside terrace with a view of the Capitol in the background. The hallway that is formed between these two “walls” serves as a transitional walkway between the entrance and the “main” conference room. The piece on the wall, created from a series of two-sided triangular aluminum structures, leads the visitor from one space to the next and echo the concept of transition by changing as the viewer walks through the hallway. The easiest way to visualize the piece is by imagining the triangular packaging of a series of Toblerone (chocolate) bars, hanging vertically and flush against a wall, in a line. If you are facing this structure and move to the left or right, your perspective changes and you see more of one side than the other. The color palette is inspired by conversations with the client on previous visits during which the color red and yellow were expressed as attractive colors. Installation by Edmond van der Bijl at the American Psychological Association, 2014.